Your account will already be populated with some default categories. You can add new categories to your account from the Admin section. Categories can be added individually or you have the option to import your categories. There is a lot of customisation around your categories that you may wish to explore. 1. From Admin, click Categories. 2. Click the New Category button. Please note: If you want to customise existing categories, click Edit found at the end of the Category name. 3. On the Details tab, give the category a name. You can also add an optional description which the user can see when they click View Categories on the expense form. 4. The Reference field is where you can input the GL Codes from your accounting package for your categories. Optional Default Tax rates - When this category is selected, the Tax rate will populate by default. To enforce default Tax rates, ensure the Policy rule 'Enforce category default tax rate' is enabled for all Policies created on the account, policy. 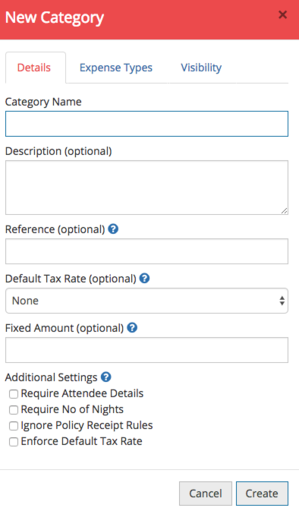 Fixed Amount - Enter a fixed amount if this category should always be a set rate. When this category is selected, it will auto-populate the amount. 6. In the Additional Settings area, you can tick the boxes for enforcing special behaviours for the categories. 7. 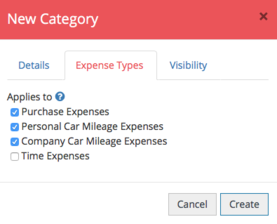 Navigate to the Expense Types tab. Here you can decide where the category should be applied to. 8. Navigate to the Visibility tab. 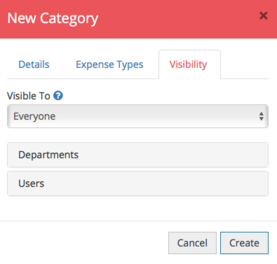 Here you can select which users, departments, and user groups can see this category when completing their expense form. When you are happy, click Create.